Using an engaging how-to approach that draws from scholarship, real-life, and popular culture, this textbook offers students practical reasons why they should care about research methods and a guide to actually conducting research themselves. Examining quantitative, qualitative, and critical research methods, this new edition helps undergraduate students better grasp the theoretical and practical uses of method by clearly illustrating practical applications. 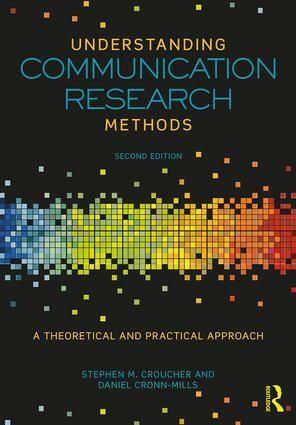 The book features all the main research traditions within communication including online methods, and provides level-appropriate applications of the methods through theoretical and practical examples and exercises, including new sample student papers that demonstrate research methods in action. Stephen M. Croucher is a Professor and the Head of the School of Communication, Journalism, and Marketing at Massey University, New Zealand. He serves on the editorial boards of more than ten journals, and served as the editor of the Journal of Intercultural Communication Research (2010–2019) and Speaker & Gavel (2010–2015). He has held and holds various leaderships position in the National Communication Association, International Communication Association, the World Communication, and holds Professorships at the University of Jyväskylä, Universidade Aberta, and the Universidade de Coimbra. Daniel Cronn-Mills is a Professor and Distinguished Faculty Scholar at Minnesota State University, Mankato, USA. Dan has authored and co-authored three books, five book chapters, and a stack of journal articles. He served for more than a decade as the editor of Speaker & Gavel (1997–2010) and has served on the editorial board of 11 scholarly journals. Dan has served in numerous leadership roles from local to national levels including the National Communication Association, the American Forensic Association, and the Communication and Theatre Association of Minnesota.